Just “slightly less than 1 percent” of all vehicles tracked in CCC between November 2017 and October 2018 contained line items containing text strings related to calibration. Only 1.9 percent of current-year vehicles recorded a calibration, while 1 percent of vehicles 1-3 years of age did, according to the CCC “Crash Course” 2019 analysis. Overall, only 0.7 percent of vehicles of any age indicated a calibration had been done. Some calibrations might have slipped through the cracks. Gotsch, a CCC director and analyst, said only manual line entries were searched. Some procedures, such as recalibrating a TPMS system, might have been among the operations able to be generated by the CCC system and therefore not tracked by the study, according to Gotsch. The term “reset” was also not among those used in the study, she said. 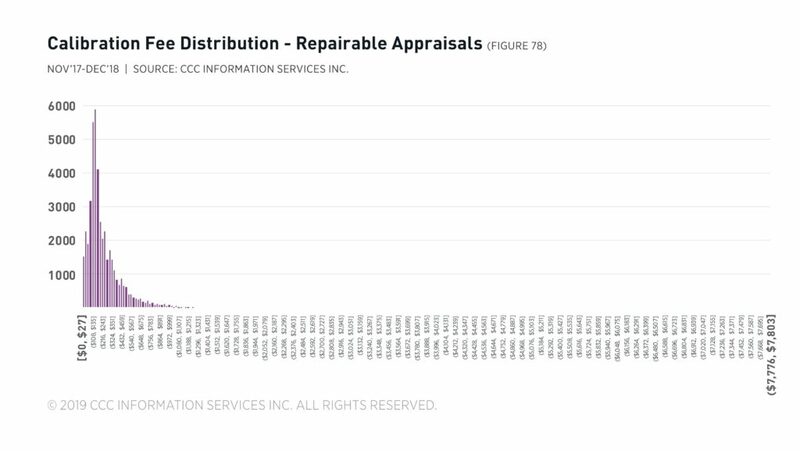 The 0.7 percent overall proportion seems low considering that CCC’s “Crash Course” also found that nearly 6 percent of repairable claims had a device like a camera, sensor or radar device replaced, up from 4 percent in 2014. Replacement of one of these sensory devices seems to cry out for it to be calibrated, unless the technology is able to self-calibrate. And far more late-model vehicles than 1 to 1.9 percent are equipped with technology that could require calibration after a collision, even if the sensory device itself isn’t replaced. The IIHS and NHTSA reported earlier this month that about half of the vehicles produced by 20 key OEMs between Sept. 1, 2017, and Aug. 31, 2018, came with autobraking standard or ordered by the customer — up from less than a third the year before. AAA in January reported 92.7 percent of new vehicle models on sale as of May 2018 had at least one advanced driver assistance system available, though not necessarily ordered by the end user. So CCC’s data suggests the industry might be neglecting to calibrate a lot of things it ought to be. Asked about the difference between CCC’s data on replaced technology and recalibrated technology, Gotsch pointed out that the analysis was limited to what information made the estimate. There might be instances where a shop calibrated a vehicle but failed to record it, she said. Or “perhaps even scarier,” the vehicle truly wasn’t calibrated, she said. Gotsch said she felt the actual proportion wouldn’t be as important to watch as the trend itself. Calibration between November 2017 and October 2018 saw a wide spread between the amount shops charged or billed sublet per calibration. The average cost was $167 — but with a standard deviation of $250 and fees reaching beyond $7,000. Most calibration was sublet, Gotsch said. The average fee rose to $207 for current-model vehicles, CCC reported. “European current model-year vehicles included calibration fees most often and with the highest average fee; lowest average fee was for Asian vehicles aged seven-years plus,” CCC wrote. Asked if the $7,000 cost related to a sublet supercar, Gotsch said that as she recalled, actually involved a 360-degree camera system on an Audi. Gotsch said the higher-dollar calibrations tended to be outsourced. 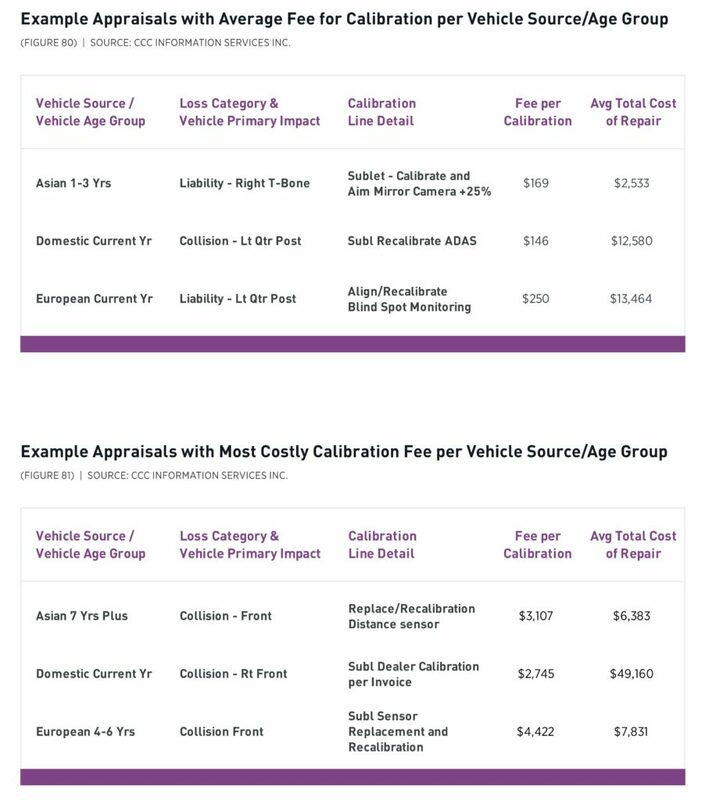 However, she said it couldn’t be determined yet whether outsourced calibrations truly cost more than in-house ones or the correlation reflected scenarios where a shop tried an in-house calibration, failed, and had to send it to a third party for two facilities worth of charges. 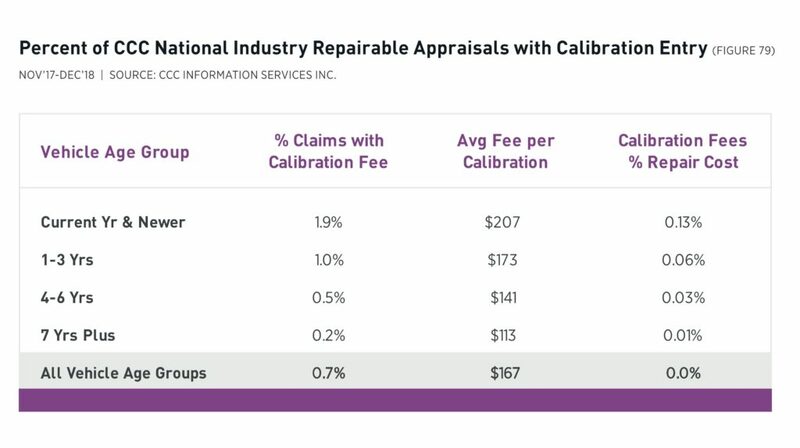 The repairers and insurers whose estimates contained a line for calibration often recorded which piece of tech was receiving the operation, according to CCC. 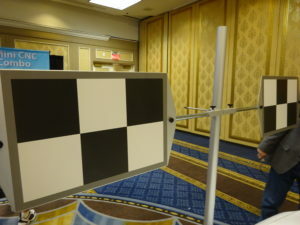 “The majority of the entries are manual entries, so the specific parts requiring calibration are not always identified clearly or at all but, not surprisingly, the majority identify a specific ADAS feature such as blind-spot monitoring sensor, distance sensor, camera, parking sensor, lane departure, adaptive cruise control, as well as mechanical parts such as occupant sensors, steering angle sensors and tire pressure monitoring sensors, and finally parts such as headlamps,” CCC wrote.